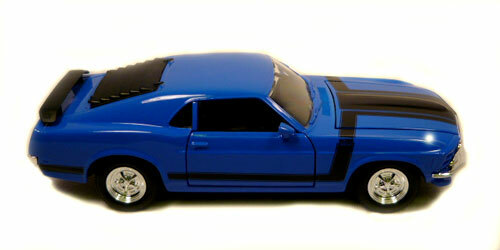 Check out our 1970 Ford Mustang Boss 302 1:24th Scale by Maisto die cast Collectors Series. The hood opens to reveal a stock black and silver engine. The doors open to a black interior with buck seats. It has black loovers on the back window and a racing scoop on the trunk. This muscle car has stock chrome wheels and black wall tires. The approximate dimensions are 7.75 inches long x 2.75 inches wide x 2.25 inches high. The shipping weight is 1.1 pounds.